It is a special friend’s birthday today and I am thinking of her, wishing that we could see one another and celebrate her birthday together … but she is in the southern hemisphere and I am in the northern hemisphere, so I am going to content myself with sending her thoughts of happiness and strength and joy instead. We met when we were in our second year of senior school, and quickly became firm friends. She was so much taller than me, and worked as a model during school holidays, to earn her own pocket money. Her parents had divorced, and her brave mother had brought my friend and her two siblings to a different part of the country, to start a new chapter in their lives. My beautiful new friend was drawn into my circle of friends on the first day at her new school, and she and I soon became close. We had an immediate understanding, a connection that only those who had known pain in early childhood could be a part of … it was not something that was spoken, only felt and accepted and respected. Our care for and about one another was unconditional. Our bond was a given; it did not need testing, it had its own strength, and it was inclusive of all of our mutual friends. After school, as sometimes happens in life, we lost touch with another as new experiences took our attention in various directions… and then I hopped to another continent, and hopped to yet another some years later, and we lost each other completely. I dreamt of finding her, but no amount of searching ever reaped rewards… until a couple of years ago. I had posted a query on our senior school Old Girls’ communication board, asking if anyone knew of her whereabouts, and suddenly someone I have never met sent me my precious friend’s contact details. It was utterly unbelievable and, like many similar experiences, it brought me to my knees in gratitude. With tears flowing down my cheeks, I contacted my long-lost friend and we have remained in contact since. But we have not seen one another in over thirty years, and I so long to knock on her door and give her a hug … with an armful of flowers … today. Like me, my beautiful friend has had to find her own way through life, face certain unusual and exceptional trials and, as when we first met, few words are needed to explain any of it to one another … we simply ‘hold each other’s hand’ and remind each other of the strength and beauty that is inside. As I think of you on your birthday, my beautiful ‘Fifty Something’ childhood friend, I send you love and I wish you the joy and happiness that you have always deserved, with the peace that comes from being completely safe, utterly cherished and exceedingly well … I hope with all of my heart that you are. Here’s to a happy, Happy Birthday … Clink! 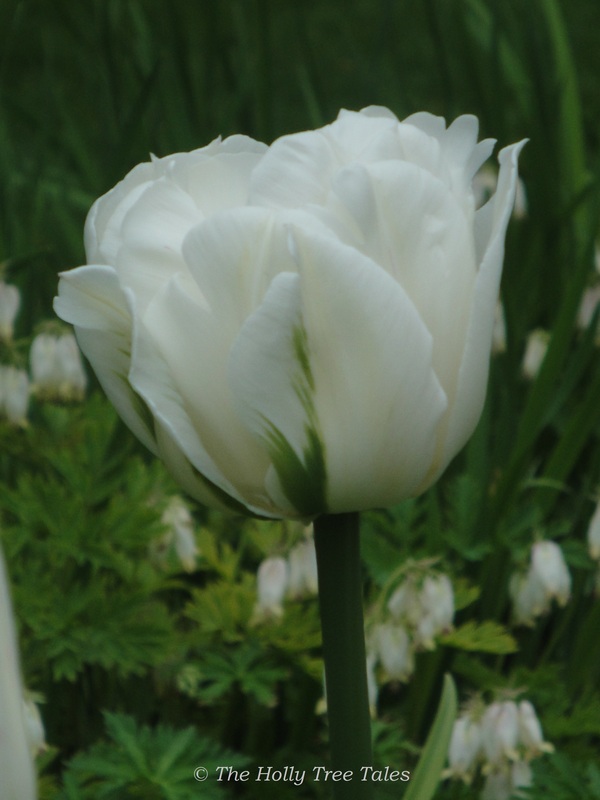 A stunning, double white tulip, symbolic to me of elegance, purity and strength.